We have three types of printing: Poster, Canvas, Wood panel. The measures are expressed in cm. 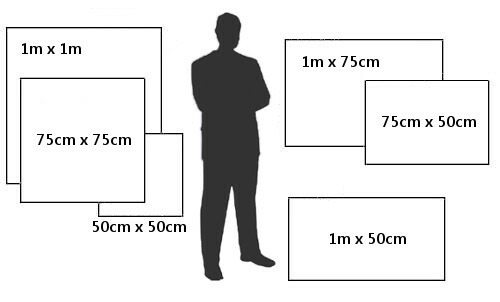 We recommend measuring at home the dimensions reported to realize the real dimensions of the print to be purchased compared to the wall where you intend to use. Non-toxic transparent paint specially designed for Shopart, it is applied by hand with the help of brushes and has the characteristic of leaving the mark of the brushstrokes in relief like real oil paintings. Visible both to eye and to touch. Are you a painter, a photographer or a digital artist? Would you like to have your works printed and sold on SHOPART? Choose to receive a FREE preview of SHOPART promotions and news. © ShopArt.it - P.IVA 01134130887. All Rights Reserved.